This section lists all kinds of nodes that trigger actions in the SUT. Besides true Java events these include pseudo events with special behavior. 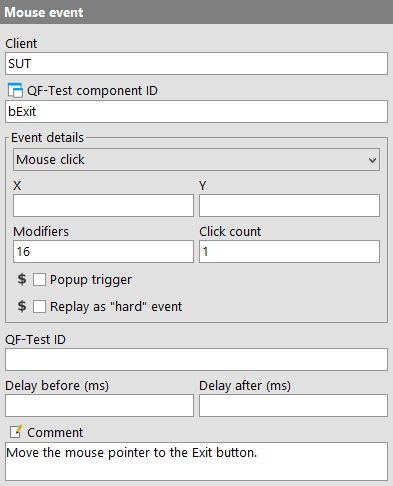 'Mouse events' simulate mouse movement and clicks as well as drag and drop operations. Contained in: All kinds of sequences. Execution: The coordinates and other attributes of the event are sent to the SUT together with the data about the target component. The TestEventQueue determines the corresponding component in the SUT, adjusts the coordinates and triggers the resulting event. The name of the SUT client process to which the event is sent. 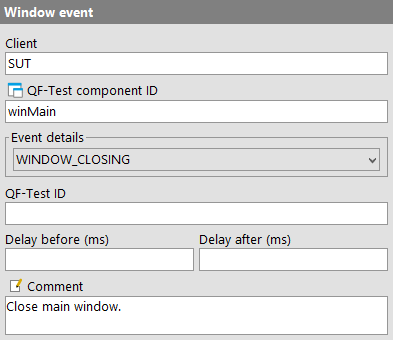 The 'QF-Test ID' of the 'Window', 'Component' or 'Item' node that is the target of the event. The button brings up a dialog in which you can select the component interactively. You can also get to this dialog by pressing [Shift-Return] or [Alt-Return], when the focus is in the text field. As an alternative you can copy the target node with [Ctrl-C] or »Edit«-»Copy« and insert its QF-Test component ID into the text field by pressing [Ctrl-V]. By using a special syntax you can target 'Items' directly or access components from another suite (see section 6.3 and section 21.1 for details). This ComboBox lets you choose the type of the event. MOUSE_MOVED, MOUSE_PRESSED, MOUSE_RELEASED, MOUSE_CLICKED and MOUSE_DRAGGED are the standard event IDs of the Java class MouseEvent. The abstract 'Mouse click' event is a compound of the events MOUSE_MOVED, MOUSE_PRESSED, MOUSE_RELEASED and MOUSE_CLICKED. During replay the pseudo event is simulated as four separate events. This adds to the clarity of a test-suite and simplifies editing. 4.1.3+ The special 'Double click' event comprises all the individual events required to simulate a complete double click. The events MOUSE_DRAG_FROM, MOUSE_DRAG_OVER and MOUSE_DROP_TO are used to simulate Drag&Drop in the SUT. See section 44.1 for details. These are the coordinates of the MouseEvent. They are relative to the upper left corner of the 'Window', 'Component' or 'Item' that is the target of the event. They can be negative, e.g. to simulate a click on the expansion toggle of a node in a JTree. Most of the time the exact coordinates for a mouse don't really matter, any place within the target will do. In this case you should leave the 'X' and 'Y' values empty to tell QF-Test to aim at the center of the target. Where possible QF-Test will leave the values empty when recording, provided the option Record MouseEvents without coordinates where possible is active. This value reflects the state of the mouse buttons and the modifier keys [Shift], [Control], [Alt] and [Meta] during a mouse or key event. States are combined by adding up their values. This value lets a Java program distinguish between a single and a double (or even multiple) click. If this attribute is set, the event can trigger a PopupMenu. This is Java's somewhat peculiar way of supporting different conventions for triggering PopupMenus on different platforms. If this attribute is set the event is replayed as a hard event, meaning it is triggered as a real system event that moves the mouse around and not just inserted as soft event into the event queue. Soft events are are typically better because they avoid impact of concurrent user mouse actions and are less likely to break due to interference from an overlapping window. Nevertheless there are certain special situations where hard events are helpful. 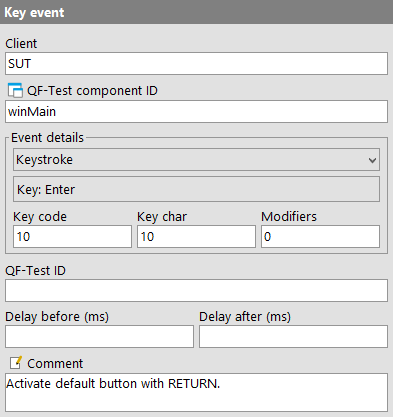 'Key events' simulate keyboard input in the SUT. These are used mainly for control and function keys. Input of text is better represented as a 'Text input'. The special keyboard event InputMethodEvent supports international character codes. QF-Test doesn't support InputMethodEvents directly. Instead, it converts events of type INPUT_METHOD_TEXT_CHANGED into 'Key events' of type KEY_TYPED. Execution: The key codes of the event are sent to the SUT together with the data about the target component. 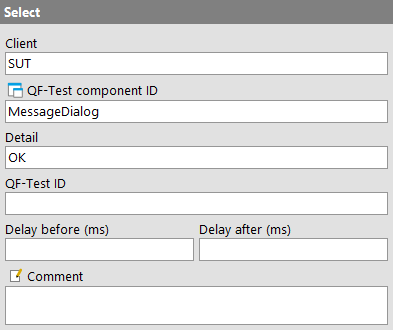 The TestEventQueue determines the corresponding component in the SUT and triggers the resulting event. This ComboBox lets you choose the type of the event. KEY_PRESSED, KEY_TYPED and KEY_RELEASED are the standard event IDs of the Java class KeyEvent. The 'Keystroke' pseudo event is a compound of the events KEY_PRESSED, KEY_TYPED and KEY_RELEASED. During replay the pseudo event is simulated as two or three separate events, depending on whether it is a printable character key, or a control or function key. In the latter case, no KEY_TYPED event is generated. This is a convenience method to set 'Key code', 'Key char' and 'Modifiers' directly by pressing the corresponding key while this component has the keyboard focus. For KEY_TYPED events 'Key char' is set to 0. Unfortunately you can't select the [Tab] key this way since it is used for keyboard traversal. 'Key code' and 'Key char' for the [Tab] key are both 9. This is a Java specific code for the key, the keyCode member of the Java class KeyEvent. This is the keyChar member of the Java class KeyEvent. Its value is the character generated created by the last key press, taking the state of the [Shift] key into account. Control and function keys always have a 'Key char' value of 65535. This is a pseudo event for simulating text input from the keyboard. A single 'Text input' node replaces a whole sequence of 'Key event' nodes. 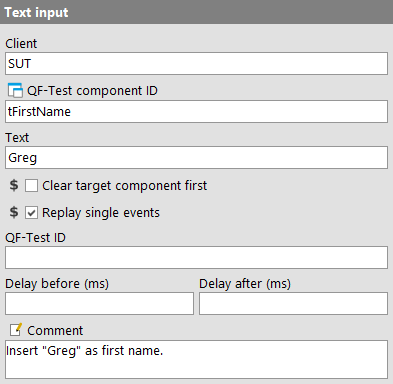 To achieve this, QF-Test takes advantage of the fact that AWT and Swing text fields listen only to KEY_TYPED events, so input of text can be simulated by triggering one KEY_TYPED event per text character. If your SUT uses custom text components that actually require the KEY_PRESSED and KEY_RELEASED events, you cannot use this node type but have to resort to plain 'Key events'. Execution: The text is sent to the SUT together with the data about the target component. The TestEventQueue determines the corresponding component in the SUT and triggers the resulting events. The text that is to be sent to the SUT. Note When inserting text into a password field it may be desirable to avoid having the password show up as plain text in the test-suite or a run-log. To that end the password can be encrypted by inserting the plain-text password, right-clicking and selecting »Crypt password« from the popup menu. Please be sure to specify a password salt before encrypting via the option Salt for crypting passwords. Restrictions: No line breaks are possible. If this attribute is set, and the target component is a text field or text area, the contents of the target component are removed before the new text is inserted. If the target component is a text field or a text area, the text can optionally be inserted by manipulating the component directly through its API. This is much faster, but if KeyListeners are registered on the component they will not be notified of the change. If this attribute is set, key events are simulated for every single character. WindowEvents are of limited use for a test-suite since most of them are not generated as a direct consequence of some user interaction. The only exception is the WINDOW_CLOSING event that is triggered when the user closes a window. It is also possible to simulate WINDOW_ICONIFIED and WINDOW_DEICONIFIED events. Execution: The event is sent to the SUT together with the data about the target window. 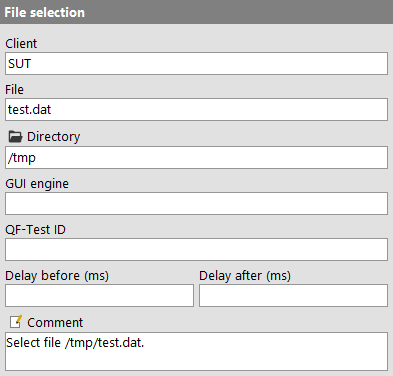 The TestEventQueue determines the corresponding window in the SUT and triggers the resulting event. This ComboBox lets you choose the type of the event. Possible values are WINDOW_OPENED, WINDOW_CLOSING, WINDOW_CLOSED, WINDOW_ACTIVATED, WINDOW_DEACTIVATED, WINDOW_ICONIFIED and WINDOW_DEICONIFIED, the standard event IDs of the Java class WindowEvent. 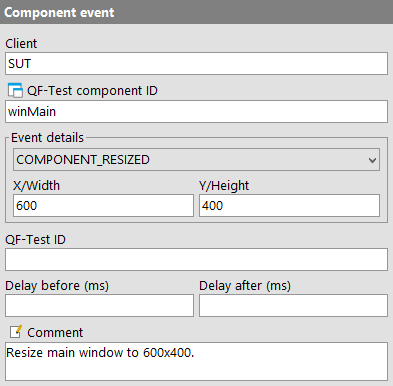 The name 'Component event' for this node may be misleading, since QF-Test filters all of these events except for windows, but since they represent the Java class ComponentEvent, it is better to stick to that name. Except for COMPONENT_MOVED and COMPONENT_SIZED events on a window, which are the result of the user moving or resizing the window interactively, all ComponentEvents are artificial and thus ignored. This ComboBox lets you choose the type of the event. Possible values are COMPONENT_SIZED and COMPONENT_MOVED, the standard event IDs of the Java class ComponentEvent. For a COMPONENT_MOVED event set this to the new Y-coordinate of the window, for a COMPONENT_SIZED event to its new height. For a COMPONENT_MOVED event set this to the new X-coordinate of the window, for a COMPONENT_SIZED event to its new width. A 'Selection' node represents an abstract event like selecting a menu item, choosing an entry in a combo box or selecting something from or closing a system dialog. Currently this event node is used only for SWT, web and Electron SUT clients, where some events cannot be triggered by "soft" mouse events, . The alternative of using "hard" events has some disadvantages as described for the 'Replay as "hard" event' attribute of a 'Mouse event'. The 'Detail' attribute determines the kind of operation to perform, or the value to select, depending on the target component. Execution: The event is sent to the SUT together with the data about the target component. The component is resolved and an action performed which depends on the type of component as listed in the table above. The 'Detail' attribute specifies the kind of operation to perform or the value to select, depending on the target component. The possible combinations are listed in detail below. Note Eclipse/RCP makes heavy use of dynamic CTabFolders where the items can be moved between folders. The items represent the actual business objects whereas the folders are just scaffolding to hold them. Besides, the layout of the folders and items can change drastically when switching perspectives. Thus it is often desirable to be able to select or close an item independent of the CTabFolder it currently resides in. This can be done by using the 'Procedures' qfs.qft#qfs.swt.ctabfolder.selectTab and qfs.qft#qfs.swt.ctabfolder.closeTab, provided in the qfs.qft standard library. Besides the ubiquitous client parameter, the only other parameter tabname must be set to the name of the item to select or close. Login dialog Username|Password or CANCEL Close the dialog and login with the specified data or abort. The password can by encrypted by right-clicking the 'Detail' field and selecting »Crypt password«. Please be sure to specify a password salt before encrypting via the option Salt for crypting passwords. ElectronThe following Combinations of DOM nodes and the 'Detail' attribute are currently support for Electron applications (see chapter 16), additionally to the ones listed for Web as above. Menus clickmenu:@/<Menu path> Where <Menu path> specifies the menu and the sub-menu item(s), seperated by /. For example, if you want to trigger the menu item Save as in the menu File you would enter clickmenu:@File/Save as for the attribute. You also need to enter the 'QF-Test ID' of the node Web page of the SUT in the attribute 'QF-Test component ID'. A 'File selection' is a pseudo event that you only need in a special case. If your SUT uses the standard AWT file selection dialog, implemented by the class java.awt.FileDialog, QF-Test has no chance to record the events the user generates while selecting a file, since they are all handled by the underlying system and never passed on to Java. For the same reason, the selection cannot be simulated as a sequence of mouse and key events. This is not the case with Swing's javax.swing.JFileChooser which is implemented as a normal dialog. Therefore QF-Test just records the result of the file selection in the form of this node and stores that data in the FileDialog upon replay before closing it. For the SUT there is no difference to an actual selection by the user. Execution: File and directory are stored in an open java.awt.FileDialog and the dialog is closed.If no FileDialog is open, a ComponentNotFoundException is thrown. The name of the file (without the directory part) that is to be selected. The directory of the file that is to be selected. The GUI engine in which to look for a file selection dialog. Only relevant for SUTs with more than one GUI engine as described in chapter 41.